"Super easy and quick dessert." Spray a skillet with cooking spray and place over medium-heat. 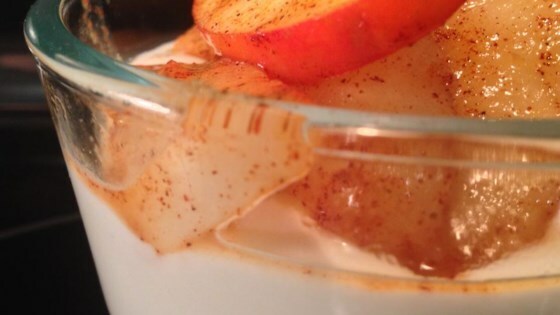 Add pear and apple slices to skillet and sprinkle cinnamon over the top. Cover the skillet with a lid and cook, stirring occasionally, until tender, 3 to 5 minutes. Divide yogurt between 2 bowls and top each with 1/2 of the apple and pear mixture.